Kick off your visit on the 1st (Mon): admire the striking features of Doge's Palace, snap pictures at Ponte dei Sospiri, then admire the landmark architecture of Basilica di San Marco, then take in the spiritual surroundings of Campo del Ghetto, and finally contemplate the waterfront views at Canal Grande. On the 2nd (Tue), you'll have a packed day of sightseeing: pause for some serene contemplation at Santa Maria dei Miracoli, then take in the views from Ponte di Rialto, then get to know the fascinating history of St. Mark's Square, and finally admire the masterpieces at Gallerie dell'Accademia. For other places to visit, where to stay, more things to do, and more tourist information, use the Venice trip planner . Las Vegas, USA to Venice is an approximately 16.5-hour flight. You can also do a combination of flight and train. You'll lose 9 hours traveling from Las Vegas to Venice due to the time zone difference. In April, Venice is slightly colder than Las Vegas - with highs of 65°F and lows of 49°F. Finish your sightseeing early on the 2nd (Tue) to allow enough time to drive to Pisa. Start off your visit on the 3rd (Wed): enjoy breathtaking views from Torre di Pisa. 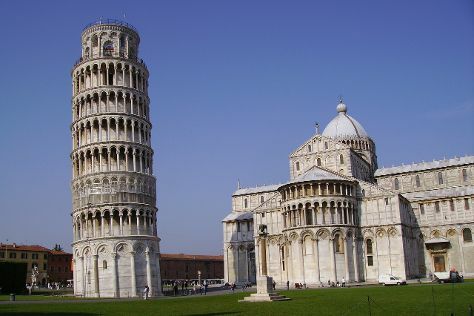 For maps, traveler tips, where to stay, and more tourist information, use the Pisa trip planner . Drive from Venice to Pisa in 3.5 hours. Alternatively, you can take a train; or fly. Expect a daytime high around 66°F in April, and nighttime lows around 47°F. You'll have a few hours on the 3rd (Wed) to wrap things up before traveling to Florence. Start off your visit on the 4th (Thu): take in panoramic vistas at The Tower of Palazzo Vecchio, explore the world behind art at Uffizi Galleries, snap pictures at Ponte Vecchio, then get engrossed in the history at Basilica di Santa Croce, and finally see the interesting displays at Galleria dell'Accademia. Keep things going the next day: appreciate the extensive heritage of Piazza del Duomo, take in panoramic vistas at Campanile di Giotto, then take in the spiritual surroundings of Cathedral of Santa Maria del Fiore, then get great views at Piazzale Michelangelo, and finally explore the world behind art at Pitti Palace. To find where to stay and more tourist information, read our Florence attractions planner. You can take a train from Pisa to Florence in an hour. Other options are to take a bus; or drive. In April, daytime highs in Florence are 67°F, while nighttime lows are 50°F. Finish your sightseeing early on the 5th (Fri) to allow enough time to take a train to Rome. On the 6th (Sat), delve into the distant past at Colosseum, get to know the fascinating history of Piazza Navona, then don't miss a visit to St. Peter's Basilica, then admire the landmark architecture of Pantheon, and finally ponder the design of Trevi Fountain. On the 7th (Sun), you'll have a packed day of sightseeing: admire the masterpieces at Galleria Borghese and then delve into the distant past at Palatine Hill. To find where to stay, ratings, photos, and other tourist information, go to the Rome road trip app . You can take a train from Florence to Rome in 1.5 hours. Other options are to drive; or fly. In April in Rome, expect temperatures between 69°F during the day and 49°F at night. Wrap up your sightseeing on the 7th (Sun) early enough to travel back home.